Webster's Daily appears to be on some kind of vacation. I've been busy with other projects -- particularly the DVD release of my documentary & eight screenings coming up in the next month -- and haven't had time to tap the untapped pages of the dictionary. 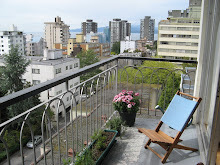 I do have a lovely new balcony for reading Webster's by the sea & I hope to be back to regular postings sometime soon. To move quickly; to quiver; to be tremulous, like fame or water; as the bickering flame; the bickering stream. That part of a clock or watch, which regulates its movements, and prevents their acceleration. A composition in which the subject must be a word of two syllables, each forming a distinct word; and these syllables are to be concealed in an enigmatical description, first separately and then together. Example. My first, when a Frenchman in learning English, serves him to swear by. My second is either hay or corn. My whole is the delight of the age. Gar-rick. A blast or stroke of an unfavorable planet. An advantage which a planet has on account of its being in some particular place of the zodiac, or in a particular station in respect to other planets. A great wave or surge of the sea, occasioned usually by violent wind. It can hardly be applied to the waves of a river, unless in poetry, or when the river is very large.